Some time ago, I also noticed the Hallmark channel (Don’t judge me! They show reruns of the Golden Girls!) promoting their collectible holiday ornaments in the middle of the summer by airing holiday movies. A whole month of Christmas in July. Double groan! And heaven help those people who proudly proclaim that their holiday shopping is done by Halloween. I’ve always wanted to throttle them. But over the last few years, in an effort to give gifts that are not only useful, but also handmade, I began to significantly revise my attitude. This downsized gift strategy was fun at first. We made memorable gag gifts and found small useful items. But there are only so many mini-flashlights any one person wants to receive. After a few years, it felt like the gifts were becoming a burden to both give and receive. (i.e. More Dollar Store disappointments than fun surprises.) So I started making some of our gifts. Lots of gratification, but not without some drawbacks. Time is always an issue when it comes to setting up a holiday sweatshop with a staff of one! 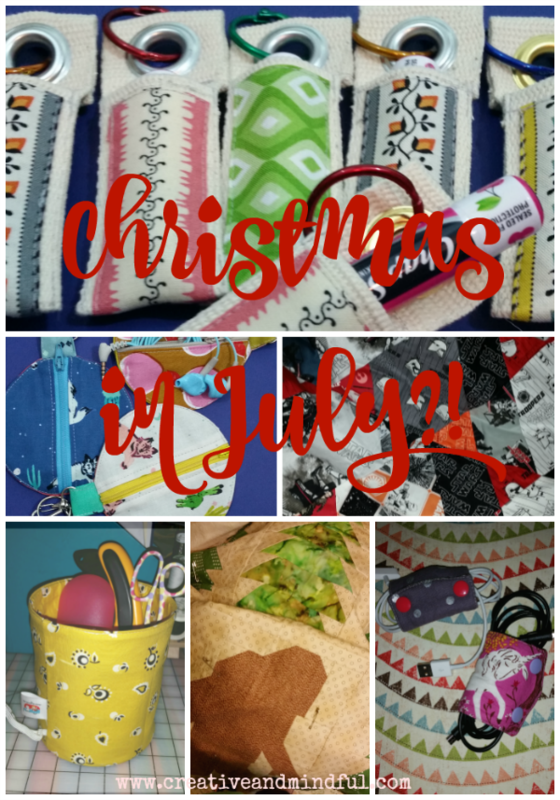 A new strategy was afoot… “Christmas in July,” Creative + Mindful style. For the adult gifts, I found simple sewing patterns for useful items I could produce assembly-line style. For a couple of very special recipients I selected more involved, more personalized projects. For the kids, I combined thoughtful purchases with some fun handmade items. Most importantly, however…. I started all of this over the summer. It wasn’t really in July, but it was definitely in full swing by August/September. With this new creative strategy, I was able to assemble and sew gifts as I had time. Occasionally, I’d put in a longer creating session when I had a weekend or evening free. For some of the projects, I even had time to make extras to have on hand for unexpected gift situations. Instead of these projects being frantic and last minute, they were a welcome break from other responsibilities. Ultimately, most of the gifts were done by mid-December. I wasn’t stressed and I wasn’t in debt. Aside from the cost of several sewing patterns and a few specialty supplies, a lot of the materials and notions came from my stash. Better yet, we got more excited thank-yous and compliments than we’ve ever have before. Throughout the year, I even see my family and friends using the things I’ve made! I have to say that is pretty satisfying and helps me look forward to the holidays more than ever. Cord keepers (or “cord tacos”): super fast, great for scraps and very useful – THIS is the (free!) pattern I used, although I installed snaps instead of velcro. I also made earbud pouches from THIS tutorial. Lip balm holders: I devised my own pattern (a strip of lightweight cotton webbing topstitched along the sides makes a perfect sleeve for standard sized lip balm), but THIS is a cute version. Makeup pouches for the teenage girls – pattern by Lazy Girl Designs: these work as tech gadget bags for boys and guys too! Pillowcases (licensed character fabric went on sale!) for the kids: I have an awesome pattern from when I became a certified Sulky instructor, but there are numerous ones out there, such as THESE (more free!) by American Patchwork & Quilting. I’ve also made these for adults. Everyone loves a special pillowcase! Pop-up buckets – pattern by The Fat Quarter Gypsy: these work great as clutter wranglers and trash bins for the car. I also made a Beatle Bag for my mom, a Legendary quilt for my hubby, and a Star Wars themed Wonton quilt for my son: these gifts were special one-offs since they involved a lot more time, although they were still fairly straightforward. Both quilts used a lot of chain-piecing and went together quickly. Legendary and Wonton quilts for my guys – simple piecing! This year, I don’t want to drop too many spoilers but I’ve had my eye on reusable shopping bags – including a design of my own that I’m working on. And I just discovered this fabric tortilla warmer that will be perfect for a few gift recipients. Even if you don’t have the ability or inclination to make all of your holiday gifts, the “Christmas in July” strategy can work for a subset of giving. Maybe make gifts just for your siblings, or for a group of close friends, or to have on hand for hostess gifts or last-minute recipients (doesn’t everyone have that person they totally forgot about??). My gifts are all sewing-based but there are tons of options, based on your own talents. What ideas do you have? I’d love to hear them!